What myth do you live by? In "Sangre y Sol", Sara Mejia Kriendler’s first solo exhibition at The Chimney, the Colombian-American artist juxtaposes two large scale sculptures that explore the conflict between the sacred and the profane, the disposable and the everlasting, the earthly and the otherworldly. In 2015, Kriendler returned to Colombia for the first time in twenty years. This homecoming immersed her in the land of magical realism and led her to rediscover Pre- Columbian art, in particular work in gold. To pre-Columbian civilizations, gold was a sacred tool for transformation with symbolic rather than economic value. The legend of El Dorado, or “the Golden One”, originated in Colombia’s Andes mountains and told of a land so full of gold that its king would coat his body in gold dust daily. It was also rumored that this king would float out to the center of a lake and sink a raft full of elaborately worked gold as a sacrifice to the sun. With the arrival of the Spaniards in the New World, the history of gold in Colombia quickly turned from magic to monstrous. This exhibition reflects the artist’s journey through this complex history. 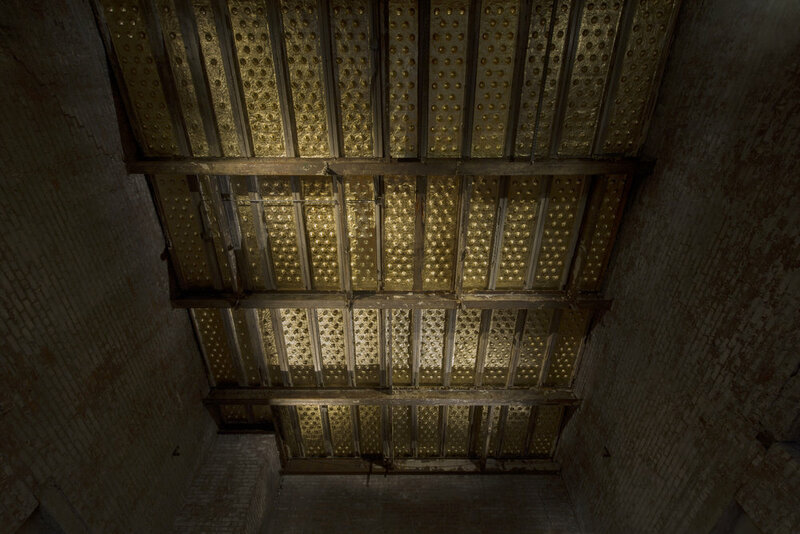 In Sol, 40 gold tinted aluminum foil panels cover the ceiling, reminiscent of the dome of a gilded church. This work reflects gold’s connection to the sublime and the eternal, but is entirely made from the flimsy foil that is typically used as candy wrapping. The foil is textured with hundreds of breast-like shapes that irradiate the space like a field of suns. While the sun was seen as a masculine force in Pre-Columbian mythology, in this sculpture the life giving power of the sun is given a female form. 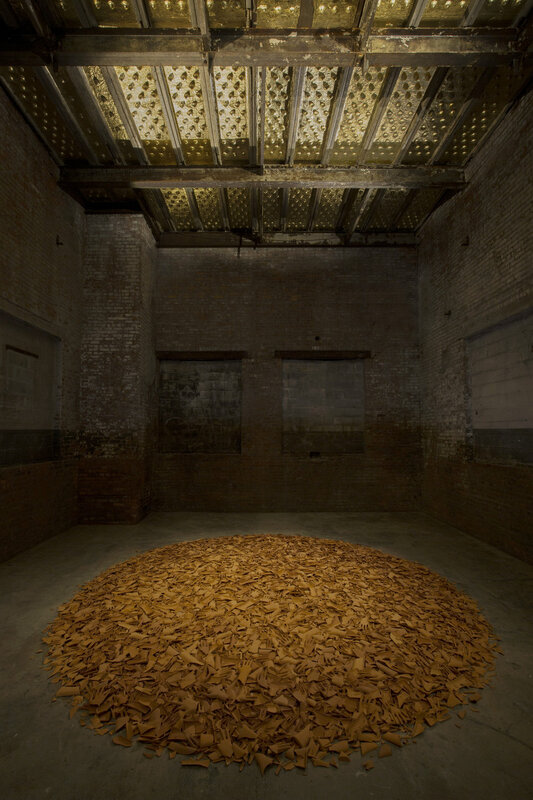 As a mirror to the ceiling piece, Sangre, a 12 feet mound of broken terracotta hands lies low to the ground. Cast from an industrial mold used to produce gloves, the hands are the result of the artist’s extensive manual labor. They appear strangely alien, at once human and yet hollow. The cracked wrists and shattered palms recall the lives lost and the blood shed in search of El Dorado. In “Myth and Realities of American Gold,” the authors compare the values of gold and clay: “the Indians could not conceive of greed, and unworked gold had the same value for them as a lump of clay. Gold only acquired its true dimension and worth when it was transformed into symbolic shape.”(1) While the hands are broken, the clay carries a weight that may outlast its shiny and more delicate counterpart. The works in "Sangre y Sol", at once obsessive and devotional, explore the transformative and destructive power of myths and meditate upon their impact on our bodies and spirits. Works of art can build myths and break them down and Kriendler’s attempt to reconcile this conflict lies at the heart of this exhibition. Sara Mejia Kriendler (b. 1983, NY, NY) is a Colombian-American artist. She studied Intellectual History at the University of Pennsylvania, trained as a sculptor at the Pennsylvania Academy of Fine Arts, and received her MFA in Fine Arts from SVA, where she received the Alumni Award Thesis Grant and was awarded the Paula Rhodes Memorial award for excellence. Her solo exhibitions include "In Back of Beyond" at the Guild Hall, East Hampton, NY (2018), "El Ocaso de Los Idolos" at Pereira Museum of Fine Art, Pereira, Colombia (2018), "Duplicates, Dummies & Dolls" at CP Projects Space, NY, NY (2016), "The Anthropocene" at A.I.R. Gallery, NY, NY (2015) and "In Arbeit - Six Memos for the Next...", at Magazin 4, Bregenz, Austria (2013). She has also participated in group exhibitions at Spencer Brownstone Gallery, Interstate Projects, and The Invisible Dog, in New York, Halt Gallery in Phoenix, and Works on Paper in Philadelphia. Her work has been reviewed on Artnet News, Hyperallergic, Newsday, Brooklyn Magazine, and Art Ravels.